An overview of all available keyblades in Kingdom Hearts 3 and their unlock order. While adventuring through the worlds of Kingdom Hearts 3, players will be able to unlock new keyblades. Each keyblade comes with different attributes including special Formchanges and Abilities. Whether you're looking for a list of all keyblades available in Kingdom Hearts 3, or you're simply wondering which keyblades unlock first, we’ve got you covered. Below, we’ve put together a guide featuring all keyblades and their unlock order in Kingdom Hearts 3! You'll start Kingdom Hearts 3 with the Kingdom Key before being able to unlock new keyblades like the Hero's Origin. The Kingdom Key from Kingdom Hearts 3. The Kingdom Key is available to you at the start of the game, and you’ll use this key to defeat enemies in the world of Olympus. Formchanges listed for the Kingdom Key include Second Form. Abilities listed for the Kingdom Key include Treasure Magnet. You can upgrade this keyblade using the Keyblade Forge section within the Synthesis menu of the Moogle Shop. The Hero's Origin from Kingdom Hearts 3. The first keyblade you unlock in Kingdom Hearts 3 is the Hero’s Origin. 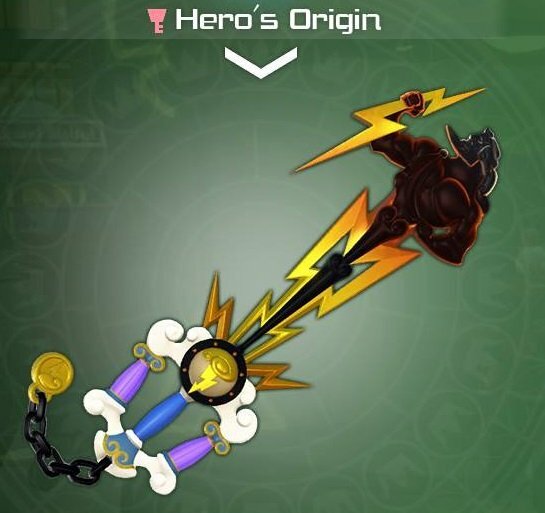 This keyblade becomes available to you after you complete the world of Olympus. Formchanges listed for the Hero’s Origin include Counter Shield. Abilities listed for the Hero’s Origin include Defender. You can upgrade this keyblade using the Keyblade Forge section within the Synthesis menu of the Moogle Shop. The Shooting Star from Kingdom Hearts 3. The next keyblade you unlock in Kingdom Hearts 3 is the Shooting Star. 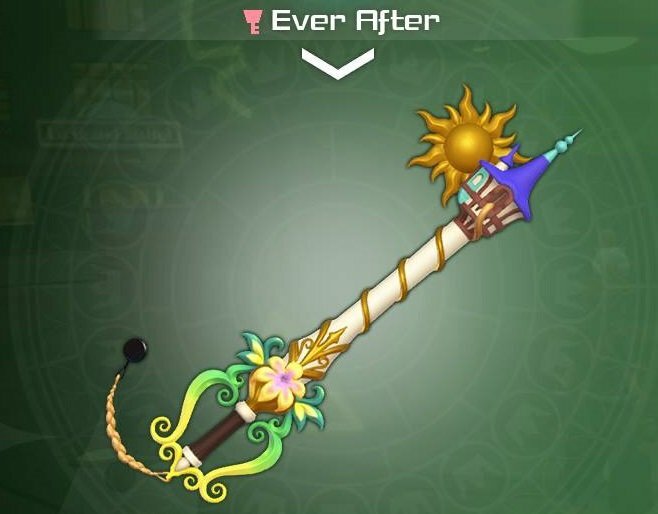 This keyblade becomes available to you after you complete the world of Twilight Town. Formchanges listed for the Shooting Star include Double Arrowguns and Magic Launcher. Abilities listed for the Shooting Star include Magic Treasure Magnet. You can upgrade this keyblade using the Keyblade Forge section within the Synthesis menu of the Moogle Shop. The Ever After from Kingdom Hearts 3. 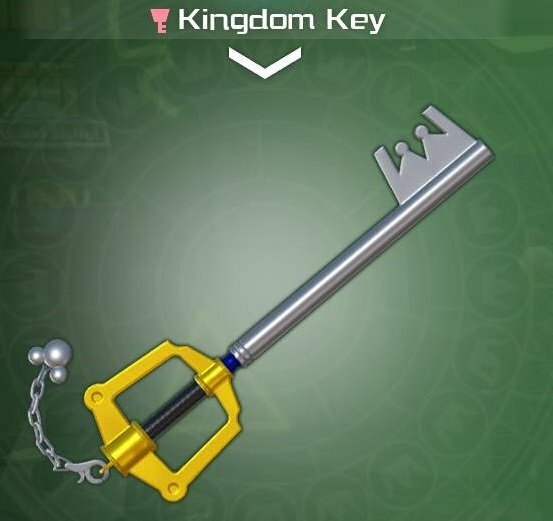 The third keyblade to unlock in Kingdom Hearts 3 is Ever After. 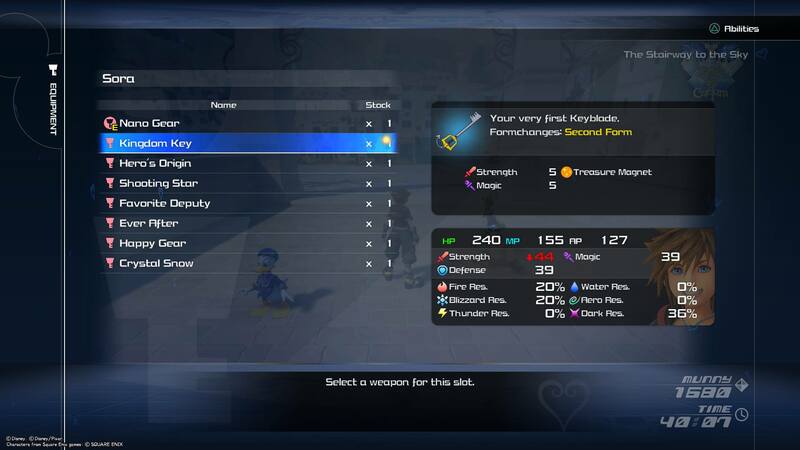 This keyblade becomes available to you after you complete the Kingdom of Corona world. Formchanges for the Ever After include Mirage Staff. Abilities for the Ever After include Leaf Bracer and Aeroza. You can upgrade this keyblade using the Keyblade Forge section within the Synthesis menu of the Moogle Shop. The Favorite Deputy from Kingdom Hearts 3. 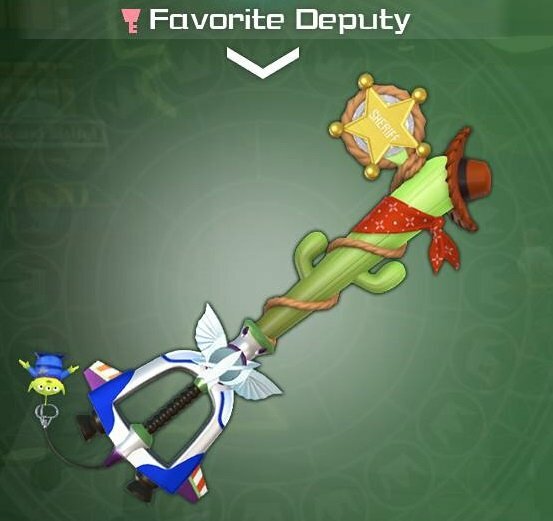 The fourth keyblade to unlock in Kingdom Hearts 3 is the Favorite Deputy. This keyblade becomes available after you complete the Toy Box world. Formchanges for the Favorite Deputy include Hyper Hammer and Drill Punch. Abilities include Lucky Strike and Formchange Extender. 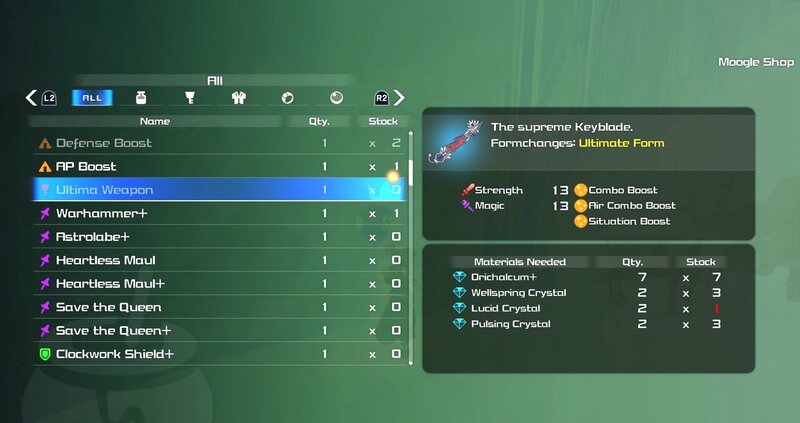 You can upgrade this keyblade using the Keyblade Forge section within the Synthesis menu of the Moogle Shop. The Crystal Snow from Kingdom Hearts 3. 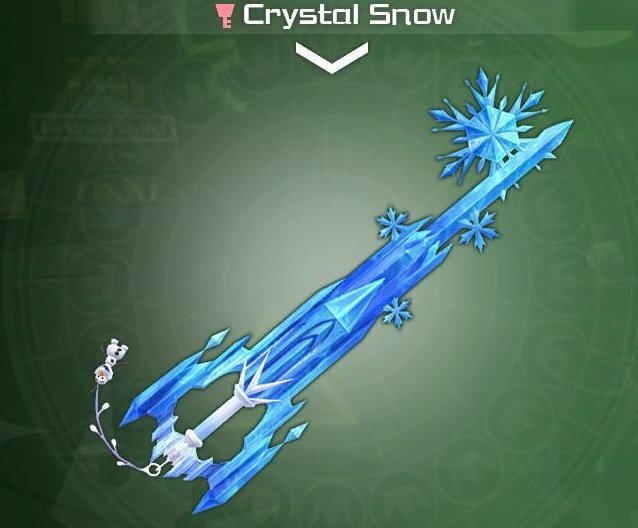 The fifth keyblade to unlock in Kingdom Hearts 3 is the Crystal Snow. This keyblade becomes available after you complete the world of Arendelle. Formchanges for the Crystal Snow include Blizzard Claws and Blizzard Blades. Abilities include Freeze Protection. You can upgrade this keyblade using the Keyblade Forge section within the Synthesis menu of the Moogle Shop. The Happy Gear from Kingdom Hearts 3. 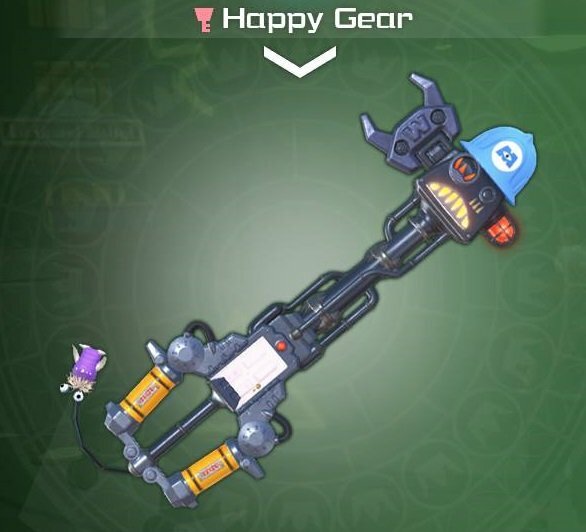 The sixth keyblade available to you in Kingdom Hearts 3 is the Happy Gear. 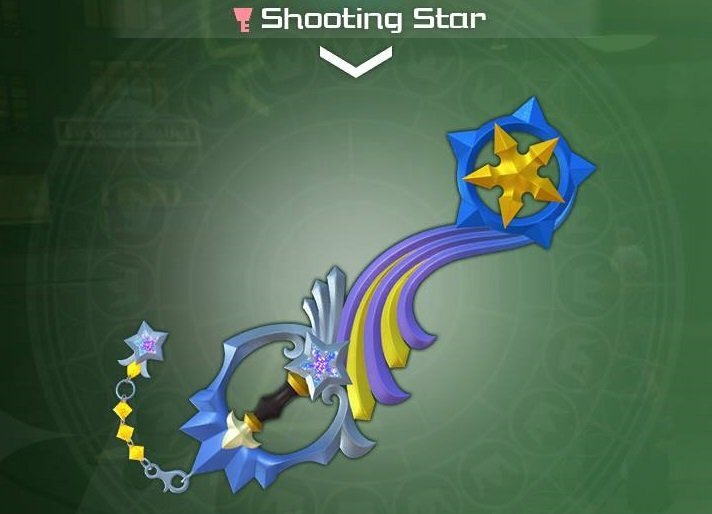 This keyblade unlocks after you complete the world of Monstropolis. Formchanges for the Happy Gear include Agile Claws and Twin Yo-Yos. Abilities include Focus Converter. You can upgrade this keyblade using the Keyblade Forge section within the Synthesis menu of the Moogle Shop. 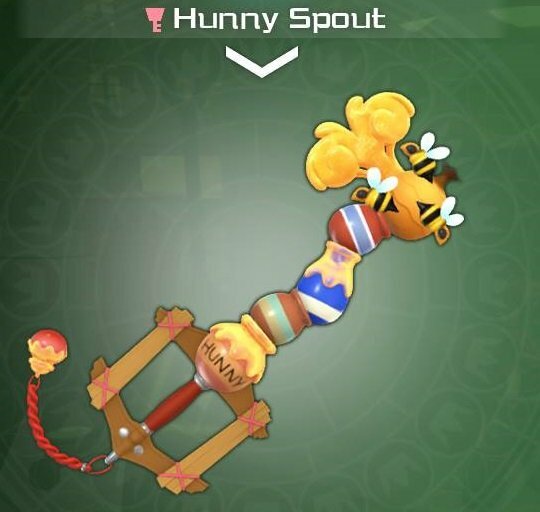 The Hunny Spout from Kingdom Hearts 3. After you complete the world of Monstropolis, you have the opportunity to return to the Bistro in Twilight Town and unlock 100 Acre Wood. Inside 100 Acre Wood, there are three match games. By finishing all of these match games, you'll unlock the Honey Spout keyblade. Formchanges for the Hunny Spout include Hunny Blasters and Hunny Launcher. Abilities include Harvester. You can upgrade this keyblade using the Keyblade Forge section within the Synthesis menu of the Moogle Shop. The Wheel of Fate from Kingdom Hearts 3. 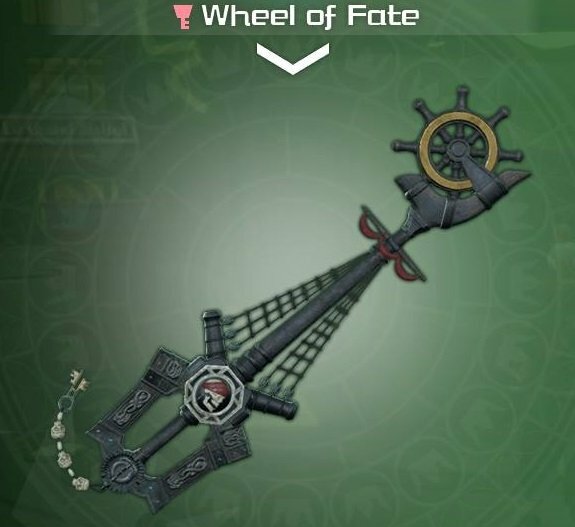 The next keyblade to unlock in Kingdom Hearts 3 is the Wheel of Fate. This keyblade becomes available to you after you complete The Caribbean world. Formchanges for the Wheel of Fate include Highwind and Storm Flag. Abilities include Waterza. You can upgrade this keyblade using the Keyblade Forge section within the Synthesis menu of the Moogle Shop. The Nano Gear from Kingdom Hearts 3. 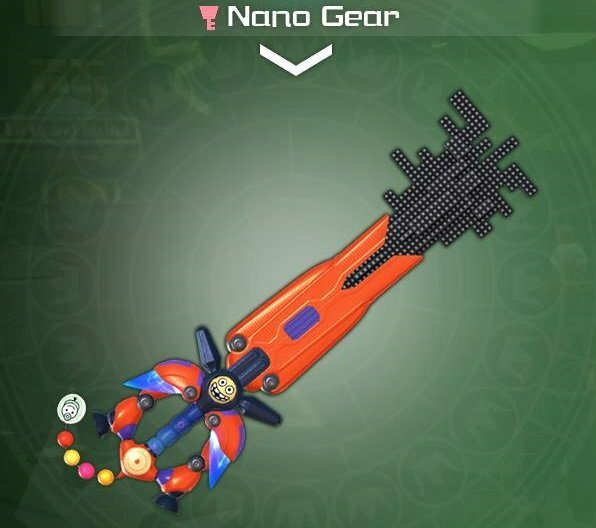 The ninth keyblade available to you in Kingdom Hearts 3 is the Nano Gear. This keyblade becomes available to you after you complete the world of San Fransokyo. Formchanges for the Nano Gear include Nano Arms. Abilities include Stun Protection. You can upgrade this keyblade using the Keyblade Forge section within the Synthesis menu of the Moogle Shop. The Starlight from Kingdom Hearts 3. 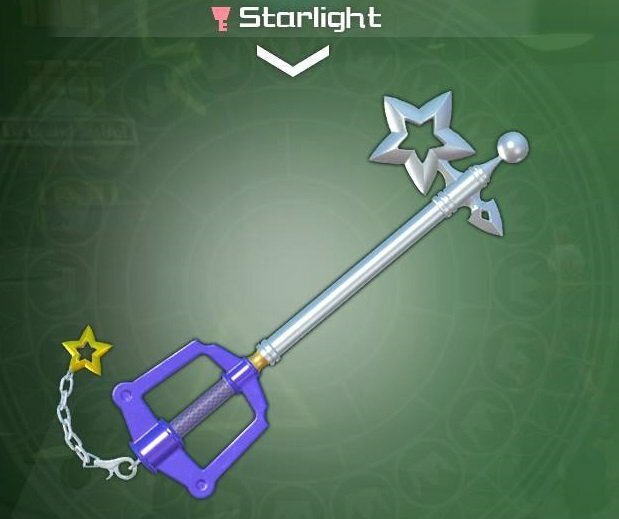 The second to last keyblade you'll unlock in Kingdom Hearts 3 is the Starlight. This keyblade becomes available to you after you complete The Realm of Darkness and The Keyblade Graveyard. Formchanges for the Starlight include Second Form S. Abilities include MP Haste. You can upgrade this keyblade using the Keyblade Forge section within the Synthesis menu of the Moogle Shop. The Ultima Weapon from Kingdom Hearts 3. This special keyblade is the most powerful keyblade in Kingdom Hearts 3, and will likely be the last keyblade you unlock. To get it, you'll need to collect all of the synthesize materials in the game, then craft it by visiting the Moogle Shop. Formchanges for the Ultima Weapon include Ultimate Form. Abilities include Combo Boost, Air Combo Boost, and Situation Boost. Gamers who pre-ordered a copy of Kingdom Hearts 3 will receive a special keyblade. If you pre-ordered a copy of Kingdom Hearts 3, you have the opportunity to unlock a special keyblade. For those who pre-ordered a copy of Kingdom Hearts 3 on Amazon, you'll receive the Dawn Till Dusk keyblade. If you pre-ordered a copy for PlayStation 4, you'll receive the Midnight Blue keyblade. 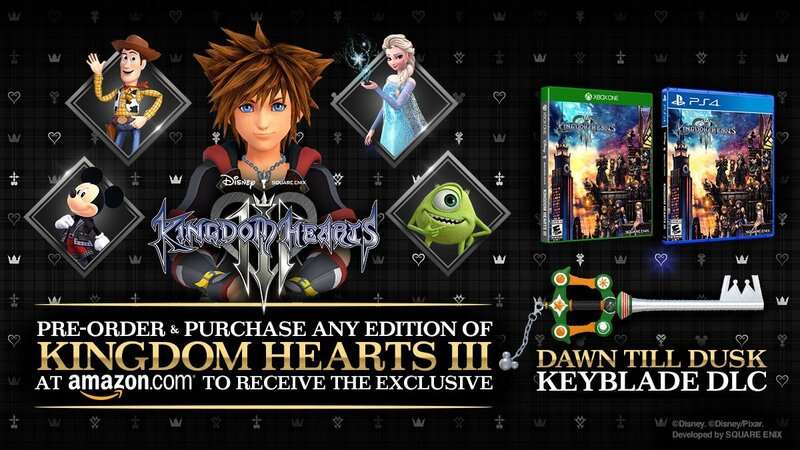 Finally, if you pre-ordered a copy for Xbox One, you'll receive the Phantom Green keyblade. After reviewing all of the keyblades available in Kingdom Hearts 3, which is your favorite keyblade to use? Do you prefer upgrading one at a time using the Keyblade Forge, or do you upgrade them all at once and use them interchangeably? Let us know down in the comments below! For more on Kingdom Hearts 3, be sure to check out some of our previous guides including the complete world unlock order in Kingdom Hearts 3, all opening choices in Kingdom Hearts 3, and how to skip and rewatch cutscenes in Kingdom Hearts 3.